Dumbbell Rows, or One-Arm Dumbbell Rows, are famous for getting that V-Shape in your back. Dumbbell rows are also known as “lawn mowers” because perfect form looks like you’re starting a lawn mower. The key to the lift is forming a “tripod of strength” using your legs and off-hand. 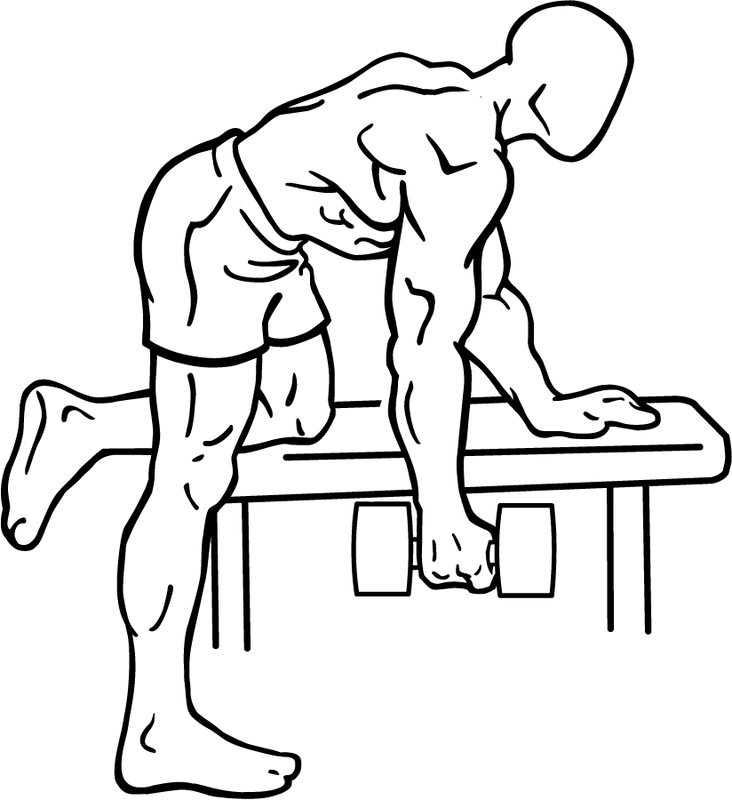 This exercise is popular in workouts for men, because a nice, V-shape looks very masculine. It is also popular with a lot of female celebrities. They like having a well-defined back and arms, because it makes your waist look smaller. The usual exercise in the One-arm Dumbbell Row. Some variations allow you to use two dumbbells at a time, or standing and using a barbell. This is usually the case if you are using light weight, and focusing on toning your back. Heavy weights are not recommended when using both hands. 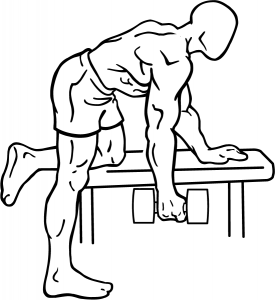 This exercise is similar to bent over rows, or reverse grip bent over rows. Hold a dumbbell in one hand, while supporting yourself on a bench with another. Bend one knee onto a bench, and support your other leg adjacent, on the ground. Keep your back straight and parallel to the bench. Exhale, and pull the dumbbell toward your torso, to the point where you would have to twist your torso to get the weight up any higher. Inhale, and lower the dumbbell back to starting position. Remember to look up, away from the lift. This will help prevent neck strain that comes from keeping your head down during the exercise. Most people start off lifting the weight straight up. Keep your back muscles parallel to the floor. Maintain breathing, and keep your abs firm. 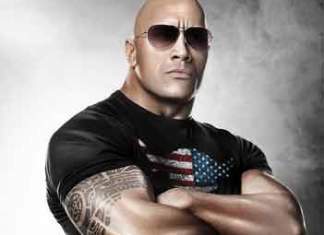 The Rock workout uses Dumbbell Rows to start his back workouts. Dwayne Johnson, aka The Rock, then moves onto Wide Lat Pulldowns and Narrow Lat Pulldowns. The Derek Jeter workout uses Dumbbell Rows as part of his superset workout. The Lady Gaga workout, created by Harry Pasternack, uses Dumbbell Rows workouts as part of her fast-paced upper body workout. The Jessica Biel workout uses Dumbbell Rows as part of her strength training circuits. The Sofia Vergara workout uses One-Arm Dumbbell Rows to help keep her shoulders, back and arms bulked up. By getting that V-shape well-formed, it help to keep her waist looking small. The Albert Pujols workout uses Dumbbell Rows to increase his back strength. This helps get the strength and extension he needs when he crushes the baseball and hits a home run. The Patrick Willis workout uses Dumbbell Rows. When he was young, he focused mainly on barbell bench. Now, he does dumbbell rows because he knows its important to work the back side as well. The Eva Longoria workout uses Standing Bent-Over Dumbbell Rows. This variation is detailed below. The Jillian Michaels 30 Day Shred workout also uses the Standing Bent-Over Dumbbell Rows exercise. The Jay-Z workout, and the Beyonce workout, both use the one-arm dumbbell rows. Marco Borges has his clients do 10-15 reps on one side, then immediately repeat on the other side. Keeping your abs tight helps keep your back straight. Start with a weight you can comfortably control until you’ve mastered the movement and it’s no longer a challenge. Know anyone that can benefit from the Dumbbell Rows exercise?